Through the Save Energy Now (SEN) program, the Department of Energy’s (DOE’s) Industrial Technologies Program (ITP) helps industrial plants operate more efficiently and profitably by identifying ways to reduce energy use in key industrial process systems. This particular case study is interesting because Mittal Steel had a large number of uninsulated hot water tanks that are used for pickling and rinsing. These tanks are maintained at approximately 175°F by steam and have a total surface area of approximately 50,000 square feet. The SEN Energy Savings Assessment (ESA) determined that a modest amount of insulation in these tanks would save roughly $400,000 in energy costs. Mittal Steel is one of the most advanced and progressive steel companies. Weirton plant is a fully integrated facility, but it has been in a state of flux. Consequently, it is currently operating at less than half of its capacity. This has a great impact relative to energy usage, because if the company goes toward full capacity it will be far more efficient. It will be able to use all of its boilers and do a significant amount of cogeneration. However, if it were to shrink further, it may be able to operate with just one boiler. Currently, it is operating with two boilers, which is more than what the facility needs. The boilers currently have to be blown down occasionally. Also, the furnaces must be turned on and off once every week. As a result of all this, it is difficult to estimate the possible savings on a permanent basis. demonstrate the use of the Department of Energy (DOE) Process Heating Assessment Software Training (PHAST) tool as an analysis aid for making measurements and collecting data. Make an introductory presentation regarding objectives and purpose. Understand the plant equipment and decide which equipment should be the focus. Make measurements and/or collect data. Communicate process heating basic concepts to relevant Mittal personnel. Discuss and train the Mittal staff in the proper use of the DOE-PHAST tool. Come up with solutions to the problems identified. Total plant natural gas usage for the base year, 2005, was 5 trillion British thermal units (TBtu) at an average cost of about $11.33 per million Btus (MMBtus). The impact of fuel cost is large and proportional to the cost of natural gas, taken as $10 per MMBtu for this analysis. Three of the opportunities identified are expected to be near term; two of the opportunities identified are expected to be medium term. The estimated percentage of plant natural gas savings from near-term opportunities is 5 percent; the estimated savings from medium-term opportunities is 5 to 10 percent. Walking beam furnaces. Actually, a mixture of natural gas and air called mixed gas, which is 70-percent natural gas, was used. Boilers. These used 40-percent natural gas and 60-percent fuel oil. Building heat. About 120,000 pounds per hour (lb/hr) were used during winter months. Wash tanks. Making hot water for these tanks in the tin mill (BA and CA) and strip mills took about 270,000 lb/hr (about 180,000 lb/hr in a tin mill and about 90,000 lb/hr in a strip mill). Cooling water flow was 3,964 gallons per minute (gpm) per furnace; Tin equals 150°F and Tout equals 180°F, which translates to 59.6 MMBtu per hour (MMBtu/hr). This is equal to about $596 per hour, since only one furnace is operational. This is low-grade heat, but it can be used instead of steam to heat the building. Acid and rinse tanks are maintained at 175°F by steam. However, these tanks are not insulated. Rolling oil and Morgoil (which is 6-percent oil and the rest water) are heated to about 140°F by steam. The facility can use the WBF hot water instead of steam. Natural gas is 1.04 MMBtu per thousand cubic feet (MCF); mixed gas is 0.72 MMBtu/MCF, or about 30 percent air by volume. This is too rich to burn at room temperature. Forty percent of the product is BA, and the rest is continuous annealing (CA). BA has 33 bases and 13 furnaces with a hydrogen and nitrogen atmosphere. Steel rolls are stacked in four rows that are each four rolls high. There are 25,000 tons per month in BA. Furnaces are open fire and are not recuperated. There is a lot of hot and clean air above the BA furnaces that could be ducted or blown to other parts of the plant for space heating. About 30,000 lb/hr of steam are used for all three CA lines. This hot water heater supplies all three of the CA lines. It provides 1,800 gpm of water at 200°F (that’s 600 gpm per line). It also uses 120 MMBtu/hr. This consumes 110,000 lb/hr of steam. In both BA and CA, water at 180°F to 190°F goes down the drain. It can be used to preheat fresh water before using steam. This is a total loss of fresh water added to Cochran heaters. All tanks everywhere are uninsulated. Surface temperature is 140°F; water temperature is 185°F. The loss equals 170 Btus per square foot per hour. It is recommended to insulate these tanks with a suitable insulation system. Due to a very large exposed surface area, this loss is quite significant. While all of the above are possible recommendations that the company must consider, recommendations that were analyzed are summarized below. 1. Schedule the one walking beam furnace (WBF) that is operating and make additional improvements. About 560 MMBtus are stored in the WBF, and it loses heat at a rate of about 8 MMBtus/hr. This shuts the WBF down 3 days a week and costs $12,000 per week—$6,000 per week x 2 (operating efficiency). Hence, every effort should be made to schedule shutdowns two times a month rather than four times a month; this saves $24,000 per month, or $288,000 per year. Other improvements include closing the opening in WBF 1, increasing the combustion air temperature, and reducing the wall losses. These amount to 38 MMBtus/hr, or $1.824 million per year. 2. Use waste heat from WBF cooling water. WBF cooling water flow is 3,964 gpm per furnace. This water is recirculated after cooling in an air-to-water heat exchanger from 180°F to 150°F. This represents about 59.6 MMBtus/hr per furnace, which equals $596 per hour or approximately $3 million per year, even when operating 4 days a week. This hot water can be used to heat the building, which is currently steam heated, and can also be used to heat rolling oil and Morgoil. There is company resistance in doing so because of the question, “What if even one WBF is not operating?” To realize these savings, the company has to install a flexible system that can switch from steam to hot water. However, it seems that the most optimum solution is to operate one WBF 24-7. 3. Recuperate the BA furnaces. The recuperators on BA furnaces are not working. 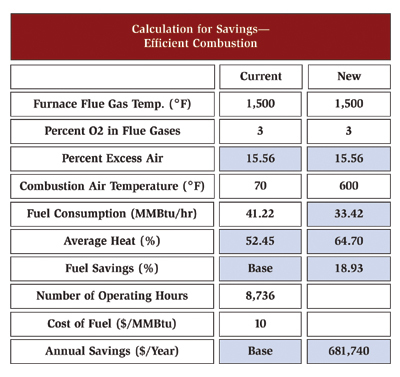 If the combustion air is preheated to 600°F, calculations (see Figure 1) show that 18.93 percent natural gas savings are possible. Monthly usage for BA furnaces is 29,676 MMBtus, or 41.22 MMBtus/hr. As shown in Figure 1, this yields a savings of $681,740 per year. 4. Reduce steam usage to make hot water in the tin mill. In both BA and CA at 180° to 190°F, water goes down the drain. This is a loss of both water and its heat content. This water can be used to preheat fresh water before using steam. This hot water is made in a Cochran water heater that heats 1,800 gpm water to 200°F. This consumes 110,000 lb/hr of steam, or approximately 120 MMBtu/hr. If the supply water to the Cochran heaters is heated to 120°F, it will save approximately 50 Btus per pound of energy. With 1,800 gpm or 901,304 lb/hr of water supply, the savings are approximately 45 MMBtu/hr, which yields $450 per hour or $393,690 per year. If just half of this was realized, the savings would be almost $200,000 per year. 5. Insulate hot water washing tanks everywhere. The surface temperature of these tanks is 140°F, and heat loss is approximately 170 Btus per square foot per hour. A conservative estimate of the total surface area of these tanks is 50,000 square feet. This results in a heat loss of 8.5 MMBtus/hr. A simple solution of insulating these tanks is recommended. Implementation costs will be very low. Assuming half of the heat loss can be saved, a savings of $371,280 per year can be achieved with this step. This article has been reprinted with permission from the U.S. Department of Energy (DOE). To learn more about the DOE’s Save Energy Now program, please visit www1.eere.energy.gov/industry/saveenergynow.